My mind isn’t so much fragmented as mush at the moment, it’s been kind of a long week, but I’ve fished out a few bits and bobs to share. For more end of week shrapnel head on over to Half-Past Kissin’ Time! On Tuesday I had my 3rd singing lesson and my teacher said nice things to me. So I guess I’m not completely delusional and there might be some point to this exercise. Who knows, one day I might even be fit to be heard in public. I’m really enjoying the lessons and the practicing, if I practice when the kids are at home Tom often plonks himself down beside me and joins in. The first five e-ARC (electronic Advance Reader Copy) chapters of Lois McMaster Bujold’s new Miles Vorkosigan book (due out Nov) are online at Baen. I’ve given in to temptation and started reading but I know I’m going to regret it when I get to the end and then have to wait. I’m also reading Mrs Darcy vs The Aliens and so should you. My 11 year old daughter has a friend staying over tonight. After dinner they watched a movie, then they took themselves off to bed and when I went at 10pm to tell them it was time for lights out I found the room dark and silent. Caitlin was still awake enough to whisper “good night” but only just. I’m not sure this is normal behaviour for 11 year olds, I’m pretty sure I’d have been going strong till at least 11pm under similar circumstances at that age. The kitchen dumping ground, this is where all the stuff that no-one knows where it goes ends up. 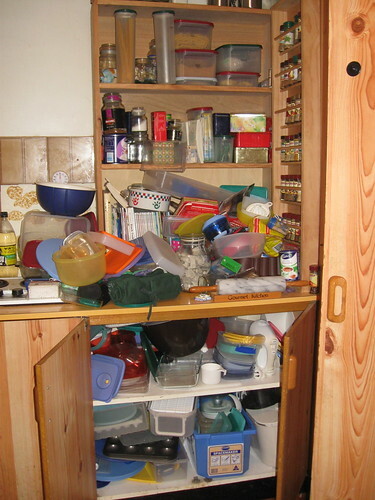 Plus there’s the tupperware cupboard which, of course, explodes into chaos as soon as someone uses the third item since the last it was beaten into submission. I decided that the first thing I should do was to alphabetise the spice rack. No, I don’t know why that seemed important, but it did forcibly bring to my attention the fact that I have a habit of buying cloves and chili flakes as though they’re going out of fashion. Sadly the rest of the kitchen still looks rather more like the first photo than the second, but hey! there’s always tomorrow. First of all, hooray for you and your singing lessons! Next, oh my gosh! 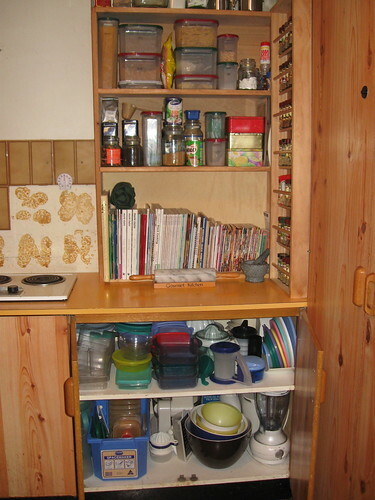 Your tupperware cupboard and spice rack – awesome! Oh my gosh that photo looks like my whole house at the moment. First we were on vacation; came home and had 2 family traumas. Now that we know both boys are going to be just fine I have made a list. I'm starting Monday. Maybe I should post about my progress too. Then I will feel like I have to get it done. Wow! I love the before and after shots of the tupperware cabinet! I have my cluttered areas – namely in my nightstand and on the floor between my nightstand and my bed. I cleaned out the nightstand yesterday and threw away about 5 lbs. of paper. Ridiculous! Congrats on your singing lessons! You should post an audio link! Impressive reorg of the tupperware. My pantry looks moderately frightening most of the time. I hate to open the door for fear that a box of Cheerios will fall on my head. I'd love to take singing lessons some day. Good for you! And kudos on the clean up. I definitely need to be doing some of that. As for your daughter? I think they were just faking, then got up after you were asleep to get into mischief. Ah the tupperware cupboard. I rearrange ours regularly but certain people in the house never place things back in there in their appropriate piles, so it gets messed up within a couple of weeks. *sigh* If we had unlimited cupboard space, it would be a lot easier. Oh my goodness. I'm just catching up with all of my blog reading. You are doing so well. So organized! Maybe I should take a lesson from the 'Book of Mim.' Way to go! I know that this looks and FEELS great!